Was Robert Richter's sexual abuse apology good enough? 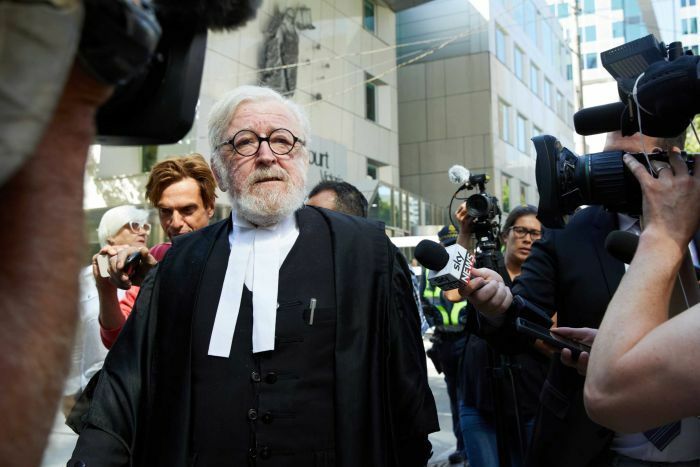 ​​UNDOUBTEDLY, ROBERT RICHTER QC will remember for an eternity his remarks in court on behalf of his client, Cardinal George Pell, at his sentencing hearing last week. Richter is one of Australia’s most prominent lawyers. Sadly for him, these offensive comments may end up being what he is most remembered for. I have had the opportunity to meet with Richter on several occasions. As a victims’ advocate and survivor of child sexual abuse, also within a religious institution, I felt an overwhelming sense of shock and pain at Richter’s words. Shortly thereafter, I decided to contact Richter to express my instinctive and heartfelt views. I said that every accused is entitled to a defence, and that I had no issue with him representing Pell (or any other criminal). But I voiced my shock and disappointment at the words he chose to use, which may pose a danger to the vulnerable within our society, and I sought an apology. Within hours, Richter responded by explaining the context of his words and apologising for them. He also sent me his powerful public apology that he had just issued, which, rightly, provided less context and simply focussed on his mistake and regret. I accepted Richter’s apology and thanked him for his response. Not all members of the public accepted his apology so readily. Some said: “Too little, too late.” Others said, “It’s not a genuine apology; he’s just excusing his words.” Yet others highlighted Richter’s controversial past – mainly the fact that he has represented some of Australia’s most notorious criminals. It gave me cause to ponder, when is an apology good enough? I reflected on my internal process, from being offended by Richter’s remarks to accepting his apology. But I felt an added sense of responsibility to my role as an international victims’ advocate. I am acutely aware that I do not represent everyone, but many, especially those impacted by the scourge of child sexual abuse, turn to me for guidance on this complex issue. So I have reflected on my position. What drove me to accept Richter’s apology so swiftly? My own experience certainly played a role. In my experience, survivors, myself included, are often quick to try to please. We readily burden ourselves with responsibility, even for matters that may be beyond our control or, worse, that are really the responsibility of others. Moreover, the positive impact of a seemingly genuine apology is so overwhelming – often after years of pain and suffering – that we would much rather clutch at it, flaws and all. However, I feel that my many years of public advocacy in this space have given me a deeper insight into apologies. I can unequivocally state that of all the innumerable apologies, both public and private, that I have witnessed or personally received over the past decade or so, Richter’s is one of the best. It was timely. He issued the apology within some 24 hours of the scandal. It was strong and comprehensive. It noted the impact his own words had on him, explained the context, and he accepted full responsibility, expressing regret and his resolve to be more careful in future. Richter did not resist the public criticisms triggered by his words, inevitably and justifiably. I thought it clearly showed that Richter was genuinely remorseful. The next question was: what precisely was he sorry for – for using these offensive comments in the first place, or for the public opprobrium they received? To many people, there is a difference between the two. Some said, “If this is what Richter says in a semi-public forum, what might he say in private?” What exactly he was sorry for is not of great import or worthy of great emphasis. Most, if not all of us, say insensitive things. Often, we do so in a safe environment – among family, friends or in an appropriate forum. Ideally, some things should not be shared in any context – racist or sexist jokes, unsupported rumours, etc. But often, we are guilty of doing so regardless. As did Richter in this case, when he used offensive language that should never be spoken by anyone in such a context. But he used them, and in the worst possible setting. And he promptly apologised for them. My purpose here is not to defend Richter. No doubt this mistake will burden him for a long time. Rather, my aim is to provide some context and understanding around the question of accountability when one’s behaviour causes offence. Within the context of child sexual abuse and its aftermath, a fundamental issue that wounds victims and survivors – sometimes as much as the abuse itself – is the lack of accountability on the part of others besides the abuser, who may have covered up the crimes or who cause offence to survivors in some other way. As noted above, Richter’s comments were highly offensive and detrimentally affected many. However, he has issued an appropriate apology, and I believe we can now proceed to more pressing issues in our ongoing efforts to address the scourge of child sexual abuse. Our demands of contrition from Richter should not be greater than what is generally expected of others, especially when Richter is compared to so many other prominent individuals, including those who believe themselves called by their religion to be a guiding light to others. Many of the latter have still not apologised, or were forced to do so reluctantly or have made meaningless and inconsequential apologies. I fully accept that not everyone will agree with my position. My sole intent here is to try to draw on my personal and public experience to inform society regarding this issue. I sincerely hope that no-one impacted by child sexual abuse is distressed by anything said above. I have always stood with victims and survivors of child sexual abuse and their families and will continue to do so. And, for as long as I can, I will continue to hold to account those who detrimentally affect victims and survivors of abuse, as well as those who endanger children today and into the future.